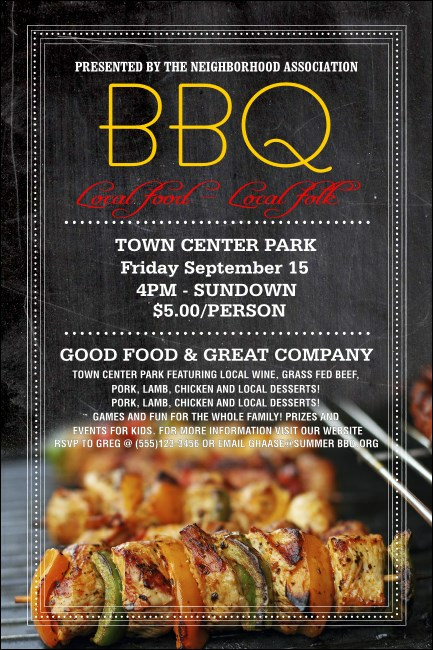 Spice up your pre-event promotions for your next BBQ event when you print BBQ Retro Chalkboard Posters in advance. Each Poster features a close up picture of chicken skewers seasoned and grilled to perfection with a retro sidewalk chalkboard in the background. Add up to fourteen lines of text to the template for all your event details. Satisfy your craving for the best event advertising with Posters from TicketPrinting.com.